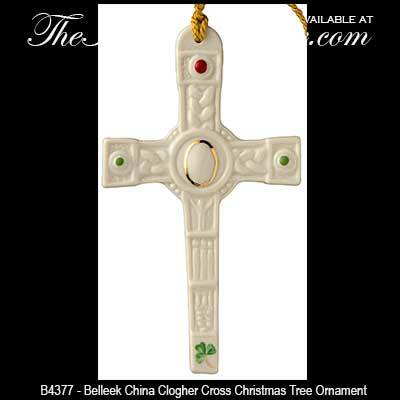 Belleek China Celtic cross ornament is a replica of the Clogher cross of Co. Mayo, Ireland. 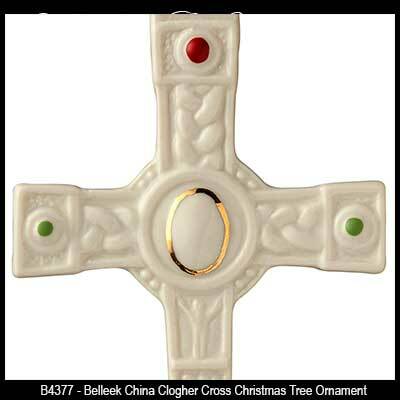 The Belleek Clogher cross ornament was introduced in 2015. The Belleek Clogher Celtic cross ornament is made of fine china that is enhanced with embossed details representing the original design. 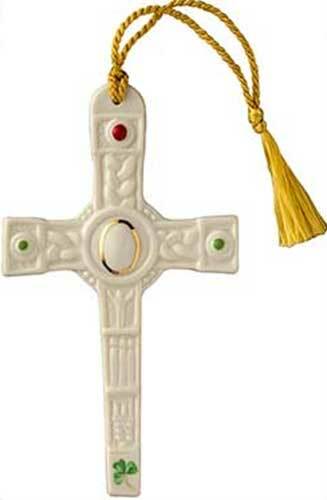 The Belleek Celtic cross ornament is further enhanced with their famous hand-painted shamrocks. The Belleek Clogher cross ornament measures 3" wide x 5" tall and it is ready to hang on your tree with the included gold tassel. The Cross of Clogher in Co. Mayo Ireland, represents a later period of Christianity. It is an oak cross completely encased in bronze. The bronze panels which are riveted on the wood are richly decorated with Christian iconography. The topmost panel depicts a crucifixion scene in high relief with angels on either side. The cross dates to between the 12th and 14th centuries and is a fine example of Irish ecclesiastical art. The back of the cross is much plainer and is composed of a series of individual panels decorated in a repeated geometric design.